ACE-sponsored Research: Hooping—Effective Workout or Child’s Play? First Lady Michelle Obama does it. So does pop superstar Beyonce. Same goes for actress Marissa Tomei and even basketball icon Shaquille O’Neill. 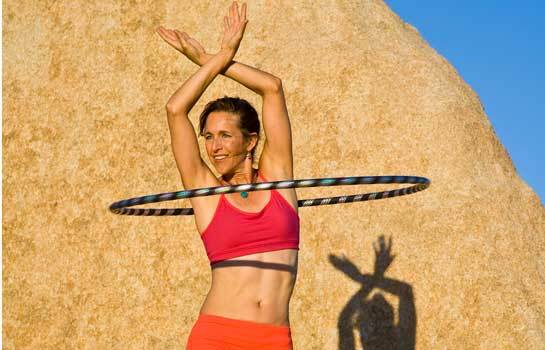 We’re talking about hooping, the modern evolution of the hula hoop. While most people think of the hula hoop as a children’s toy that was all the rage back in the 1950s, the history of hula hooping dates back thousands of years to Egypt and ancient Greece when hoops fashioned from grapevines were actually used for exercise. Modern hooping started primarily as a form of dance expression using larger, weighted hula hoops, but in recent years it has found its way back into the fitness world. Trendy gyms like Crunch and Equinox have incorporated hooping into Pilates and yoga classes, while hooping-specific classes and fitness studios are also blossoming around the country. These hooping classes generally incorporate a wide variety of hooping choreography and dance music into a fun and fast-paced group workout. Hoopers are now using hoops that are 37 to 45 inches in diameter and weigh 1 to 4 pounds. These larger, heavier hoops rotate around the body more slowly, making it easier to hoop while potentially burning more calories and eliciting improved fitness benefits. Although hooping has become something of a fitness craze and proponents promote the activity as a full-body workout capable of burning up to 600 calories per hour, “there has been no scientific literature to support the fitness benefits of hooping,” says Jordan Holthusen, M.S., an exercise researcher with the University of Wisconsin, La Crosse. So in an effort to cut through all the hoopla and buzz about hooping, the American Council on Exercise enlisted Holthusen and her colleagues to study the activity’s potential cardio and calorie-burning benefits. To gauge the exercise intensity and calorie-burning potential of hula-hooping workouts, a team from the Exercise and Health Program at the University of Wisconsin, La Crosse, led by Holthusen and John Porcari, Ph.D., recruited 16 female volunteers between the ages of 16 and 59, all of whom were intermediate- to advanced-level hoopers. Prior to actual testing, each participant was allowed to do two practice sessions using a 35-minute hooping workout video developed by Mary Pulak, founder of Hooked on Hooping, a group hooping exercise studio based in Green Bay, Wisc. The video featured a five-minute warm-up followed by a 30-minute hooping workout including seven different dances and a wide variety of choreography. Once they were comfortable with the workout, each participant donned a portable oxygen analyzer and a Polar heart-rate monitor while they hooped along to the exercise video at their own pace using a weighted hoop. Researchers recorded heart rate (HR) and oxygen consumption (VO2) at one-minute intervals during the 30-minute workout. Participants were also surveyed every five minutes on their individual ratings of perceived exertion (RPE) based on the Borg Scale. Following testing, the researchers sliced and diced the data, determining that hooping burns an average of seven calories per minute for a total of about 210 calories during a 30-minute hooping workout. As for heart-rate data, the average HR was 151 bpm (beats per minute), which works out to approximately 84 percent of the age-predicted HRmax for the average subject (Figures 1 and 2). Meanwhile the oxygen consumption (VO2) average was about 20.6 ml/kg/ per minute (Figure 3). Finally, the RPE average for the workout was rated by participants as “somewhat hard” on the Borg Scale. “Hooping compares pretty favorably with most other group classes, in terms of heart rate and calorie burn,” says Porcari. In fact, exercisers can expect similar results from hooping as they’d get from boot-camp classes, step aerobics and cardio kickboxing—all of which meet fitness industry criteria for improving cardiovascular fitness (Table 1). Also, by burning approximately 210 calories per 30-minute session, hooping falls within accepted guidelines for exercise that can contribute to weight management. Hooping is an excellent form of exercise. In addition to the hard data the researchers uncovered, Porcari suggests that given the variety of movements in hooping it should be considered a total-body workout that has the potential to improve your flexibility and balance while strengthening and toning the muscles of the back, abdomen, arms and legs. The rhythmic nature of hooping may also be relaxing and almost meditative for some. Subscribe to our YouTube video channel. This study was funded solely by the American Council on Exercise. Workout Watchdog: Eating Clean—Another Food Fad or a Commonsense Approach to a Healthy Diet? Important issues surrounding health and wellness have been on the forefront of the national conversation this year, providing ACE with many opportunities to share our mission for creating a more fit America. Discover the impact ACE programs have had on people's lives with the 2010 ACE Impact Report. ACE live webinars are an ideal way to earn CECs in the comfort of your own home, while still getting the benefit of a live expert instructor with whom you can interact during the course. Learn about upcoming webinars including Weight Management Strategies for the New Year's Resolution and Anatomy & Kinesiology of the Lower Extremity. ACE is regularly featured in the media, reaching more than 450 million people each year. From coverage on WebMD.com featuring how to make your walk a workout, to articles in popular magazines including Health and SELF, read the latest from ACE in the News.